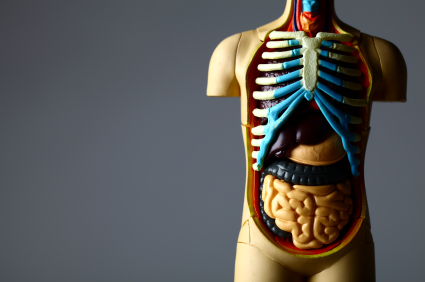 Your intestines are fundamentally designed to cope with shoots, leaves, fruit and roots, which have been the staple food of human beings from the beginning (see Digestion). You can digest these economically and at very low risk, using enzymes and alkalis which do not threaten your own flesh. People who stick to vegetable food make practically no acid in their stomachs, where they simply condition each meal for digestion by letting its fibre moisten and swell to a jelly pulp. To cope with food from animals, your ancestors have equipped your stomach for an extra function. Its lower half is adapted to house an acid bath and extra enzymes which specialize in digesting flesh food. But the meat in your meals has essentially the same quality as your own flesh; this acid bath is quite capable of digesting you! To prevent this you depend on a delicately poised system of self-defence. Your stomach wall makes catarrh which acts as a barrier to acid attack. If your food contains plenty of vegetable fibre and you have chewed it enough, this swells to a stiff gel which takes up the sour gastric juice and prevents it from trickling too easily into contact with your stomach lining. The massaging action of your stomach maintains its contents as a laminated whole, as if kneading flaky pastry: the acid and enzymes are kept inside and the catarrh barrier is seldom overwhelmed. If you abuse this system it easily breaks down. Regular consumption of fluorides in toothpaste, tea or fluoridated water can reduce mucus production in the stomach and cause indigestion. White flour and cereals provide too little fibre to gel and buffer your stomach contents so that they slop about mischievously; indigestible starch grains from white bread irritate your stomach like sand in your shoe. A quick bite chewed in haste will not moisten enough for proper handling in any case, however much fibre it contains. Eating hastily or in the wrong mood makes your stomach nervy and dry too. It produces too little catarrh to defend itself and acid irritation provokes clumsy spasmodic contractions instead of a smooth massage. These fragment its contents indiscriminately, increasing yet further their contact with its lining. Your skin cannot cope with this kind of challenge. At first it just gets rough and inflamed, feeling vaguely uncomfortable. If this is neglected it may burn right through, giving much sharper pain and a full ulcer. Further neglect may lead to a hole right through your stomach, or heavy bleeding from its veins; both are surgical emergencies. 1. Drink at least two litres (4 pints) of water daily, mainly as half a litre before each meal. This ensures that you have enough to make sufficient defensive catarrh of the right quality to line your stomach. 2. Relax properly before a meal, and devote enough time to it. If you cannot, postpone the meal; but review your routine if this becomes a habit. 3. Chew every mouthful thoroughly and well to gratify your appetite and get your digestion at work on it. Get everything fluid before you swallow it. 4. Never eat anything that is intensely sweet — confectionery, spoonsful of honey — directly onto an empty stomach. This is misunderstood by the stomach and reacted to as if it were meat — enzymes and acid are poured into the stomach, and there is nothing for them to do except attack the stomach lining. 5. Do not neglect discomfort at the top of your stomach, just under your ribs, whether it occurs before or during your meals. Take dietary steps at the very least, every time. Cut out beer and spirits, coffee and strong tea. Mint teas make soothing substitutes. 6. Eat the diet for health avoiding sugar, white flour products, meat, fish, eggs and hard cheese for at least three weeks. Thereafter never hasten a meat meal, least of all a sandwich: use only wholemeal bread and cereals and continue to avoid sugar totally. 7. Angelica and comfrey stems contain a mucilage which soothes your stomach: chew either when your stomach is empty. It may ease pain until your next meal relieves it. Liquorice root — not sweets — can be chewed regularly to promote ulcer healing. 8. Absorbaid is a plant-based enzymic product designed to improve digestion that is incomplete as well as dysfunctional. This is worth a trial if the simple measures listed above do not improve the situation. 9. If your pain persists consult your doctor. He may arrange for tests to prove its origin and give you medicines to neutralize the acid or tablets to stop it being formed. These allow the ulcer to heal but make it hard for you to digest meat comfortably; follow the diet based on vegetables as well. To get off the tablets and stay healed you will need to keep the diet going. 10. If tension unsettles you at mealtimes and produces too much acid, seek fundamental help to correct that. 11. Homoeopathic treatment (see also Complementary Medicine) works on your own particular vulnerability which is worked out by detailed study of your symptoms. You will need professional advice (addresses for each therapy on their relevant page - go to therapies menu) and must still attend to your diet. 12. Medical treatment for ulcers tends to rely more and more on drugs that cut down acid production in the stomach. This reduces acid erosion of your stomach lining, which is fine, but it also means that you cannot any longer digest meat or other flesh foods very well. Therefore, even if you are taking medication to heal and prevent ulcer formation, you will need to follow the dietary precautions in this leaflet. Apart from anything else, you should save a few prescription charges since the diet will cure you properly, which tablets never can; people tend to need constant treatment, or at least continual repetitions.